In a joint effort between the Simons Collaboration on Ocean Processes and Ecology (SCOPE), the Monterey Bay Aquarium Research Institute (MBARI), and Schmidt Ocean Institute (SOI), several long-range autonomous underwater vehicles (LRAUVs) have successfully completed their first voyage in the open ocean, obtaining data on the water column down to 250 meters, while autonomously collecting and archive seawater samples to capture microbial community dynamics in the oceans interior. Since March 10, 2018, the team on research vessel Falkor has been deploying these new robots programmed with several different mission goals, to provide an unprecedented high-resolution view of open ocean microbes. The AUV’s were deployed for the first time in Hawaiian waters, and remained in the water collecting data for nearly 100 hours before recovery. Timing is important as it allows for the science team to map the eddy’s structure in 3D while sampling over the course of several daily cycles. This temporal sampling is key, since like people, microbial plankton are believed to synchronize their activities in repetitive daily cycles. The LRAUVs could simultaneously map and sample the oceanographic eddy features in much greater spatial and temporal than would have been possible using other platforms. Eddies have been difficult to study because of their natural variability, which means their impact on ocean biology, specifically the microbial communities trapped inside, is not well understood. This cruise focused on a cyclonic eddy, rotating counterclockwise, which results in an uplift of the water column that brings nutrients and organisms from greater depths closer to the surface, and sunlight. This is thought to enhance phytoplankton’s primary productivity and activity in microbial communities that typically reside in deeper, darker waters. The expedition’s Principal Investigators Drs. Edward DeLong and David Karl, oceanography professors in UH Mānoa’s School of Ocean and Earth Science and Technology (SOEST) have been studying these microbes for decades. 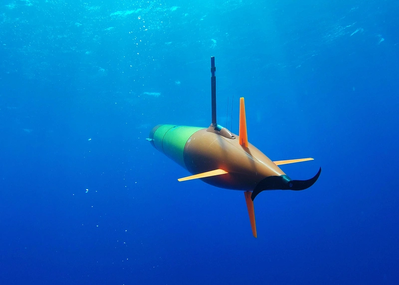 “These new underwater drones will greatly extend our reach to study remote areas, and allow us to sample and study oceanographic events and features, even when ships are not available,” said DeLong. “Looking at a day in the life of all these ocean microbes and autonomously tracking them to see what happens on a day-to-day basis is something that’s never been possible before”. Eddies are large (~100 km in diameter) so using autonomous instruments such as LRAUVs, greatly facilitates studies of their variability on relevant spatial and temporal scales. The Falkor’s month long, in the water ground-truthing will also help to validate and inform remote observations of eddy structures and evolution that are derived from satellite data. In addition, experiments conducted by the SCOPE scientists onboard the Falkor and in the sea will provide new information on how eddy physical features affect biological processes and ocean productivity over time. The lead scientists expect to derive unique insights into the duration, stability, and influence of eddies on ocean ecosystems; and will improve current ocean biogeochemical models that are critical to understanding the current and future health of the world’s oceans. Additionally, the LRAUV-collected samples containing microbial community DNA, will be analyzed back on shore with genomic studies aimed at understanding the function, activity and environmental sensitivities of microbial populations that form the foundation of the ocean’s food web.